KM Packaging Services Ltd has helped an award winning, high street supermarket chain to launch an innovative new range of premium ready meals in unique coloured aluminium trays, by providing a versatile, tailor-made film lidding solution. KM worked alongside several UK manufacturers to develop the sophisticated range of around 50 different trays with two different lidding solutions for both hot and cold peel. The trays are unique in that they have an attractive cream lacquer both inside and out – a particularly challenging surface for KM to tackle. Nevertheless the lidding specialist came up with a high clarity ovenable and peelable solution with excellent anti-fog properties and a high oxygen barrier, suitable for ready-to-heat meals. KM Packaging’s Commercial Director Graham Holding explained: “We’re always excited when an opportunity arises to be part of a completely new product launch – especially one that’s so closely aligned to our original revolutionary work with aluminium trays. In this instance we faced particular challenges with the lacquered surface which has quite different qualities to plain aluminium. 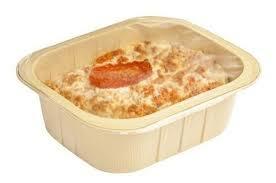 With meals that are pre-cooked in the tray we also had to mitigate against the potential risk of product contamination. KM’s unrivalled range of film lidding solutions and proven technical expertise were key to the company’s success in this project, which showcases a solid cream colour on both the inside and outside of aluminium trays for the first time. Although many of KM’s lidding solutions are designed to extend shelf life, the company’s flexibility and commitment to rapid turnaround mean that it can also meet the supermarket’s demands for fast delivery on short-run seasonal products.